We’d love your help. 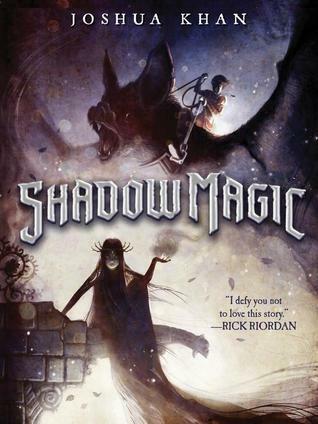 Let us know what’s wrong with this preview of Shadow Magic by Joshua Khan. Lilith Shadow wasn't supposed to be ruler of Gehenna. But following the murder of her family, young Lily became the last surviving member of House Shadow, a long lin Thorn, an outlaw's son, wasn't supposed to be a slave. He's been sold to Tyburn, an executioner, and they're headed to Castle Gloom in Gehenna, the land of undead, where Thorn will probably be fed to a vampire. To ask other readers questions about Shadow Magic, please sign up. So is the next book about my favorite Lily? Joshua Khan Three right now. Shadow Magic (out), Dream Magic (April 2017), Burning Magic (April 2018). It's not really fair for me to recommend this yet, because you won't be able to buy it until it comes out in April, but I would highly recommend you keep it on your long-term radar. Have you ever started reading a book thinking, 'Oh, well, I may not like it but I'll give it a try,' then quickly found yourself sucked into the story and thinking, 'Holy Hera, this is good!' That was my experience with Shadow Magic. It's told from the alternating perspectives of Thorn, the wayward son of an outlaw, a It's not really fair for me to recommend this yet, because you won't be able to buy it until it comes out in April, but I would highly recommend you keep it on your long-term radar. Have you ever started reading a book thinking, 'Oh, well, I may not like it but I'll give it a try,' then quickly found yourself sucked into the story and thinking, 'Holy Hera, this is good!' That was my experience with Shadow Magic. It's told from the alternating perspectives of Thorn, the wayward son of an outlaw, and Lillith Shadow, the heir of one of six ancient magical kingdoms. There should be no reason for these two to ever cross paths, but they do, and the combination is explosive. Thorn, a young nobody from the north, is captured and sold into slavery to an executioner named Tyburn, who happens to work for the kingdom of Shadow. Thorn arrives in the land of darkness, and is soon plunged into a mystery with Lillith about who killed her parents. We find out that Thorn and Lillith both have unexpected powers and many secrets. We meet some fantastic characters, including a giant bat named Hades (How could I not love that?). 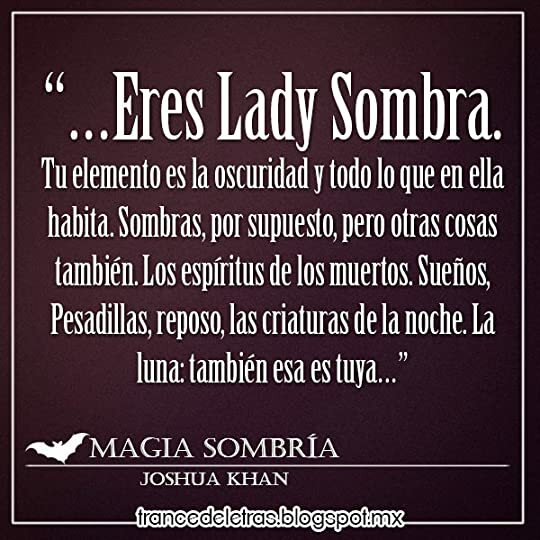 Magia Sombría es una aventura excitante protagonizada por un grupo variopinto en un mundo lleno de oscuridad y misterios donde le dan todo un ingenioso vuelco a los clichés de la fantasía. Me ha gustado mucho. Previsible pero muy entretenido y con una ambientación fantástica. Now this was a fun book! Shadow Magic has all the stuff I love in my escape. The writing is seriously fantastic with it's crisp storytelling, the characters are imaginative, witty and wonderfully wicked and the world has me craving for more! This goes right up there with Harry Potter and Percy Jackson! I can't wait for book two!! Highly recommended! 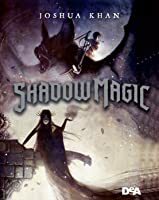 Mi è capitato di ricevere una copia digitale di Shadow Magic, un fantasy per ragazzi che ammetto pensavo non fosse adatto a me, sia per genere che per target di riferimento e, infatti, sulle prime battute ero tentata di mollare… però, pagina dopo pagina, sono entrata nell’opera e alla fine mi è anche piaciuta tanto. Leggendo, la prima impressione è stata di trovarmi in una sorta di Game of Thrones molto edulcorato: casate, guerre, matrimoni combinati per stabilire la pace, “gente che vuole ammazzare gente”, ma poi tutto prende una piega diversa: magica. La trama ha risvolti inaspettati e altri prevedibili, ma l’originalità che la contraddistingue sta nella scelta di unire il paranormale e l’horror a un contesto fantasy classico. If you enjoy fast paced sword and sorcery, this will be an impossible high fantasy novel to put down. The characters are compelling, the world building is well-crafted, and the plot is riveting. The fantasy reminded me of Lloyd Alexander's Prydain series while the twists and turns of the plot brought Jennifer Nielsen's The False Prince to mind. Recommended for those middle grade readers who are on the lookout for the next series to read after Harry Potter. ¡Este libro me ha sorprendido un montón! Me enamoré de la ambientación, personajes y la pluma del autor. Me tardé en leerlo por circunstancias personales pero estoy segura que lo hubiera terminado en dos días. Questo romanzo cattura fin dal principio, scritto in maniera scorrevole, grazie all'alternarsi delle voci di Thorn e Lily, ci concede la possibilità di addentrarci in una storia che ci porta a vivere un'avventura piena di magia, azione e pericolo, in una miscela che ci fa ritrovare quel sapore delle favole di una volta e che con immenso piacere ci ritroviamo a vivere. Quello che mi ha stupito maggiornmente è che, nonostante sia un romanzo destinato soprattutto ai più giovani, nulla in questi luoghi così oscuri crea disturbo anzi, come già detto prima, contribuisce a rendere la storia più intrigante e misteriosa, in una miscela che vede il buio e la luce contrapporsi tra loro. Non c'è che dire, il romanzo di Joshua Khan ha superato ogni mia aspettativa e, sono onesta, dubbio, visto che generalmente tendo sempre a diffidare delle opere che hanno dietro una grande lavoro di pubblicità. Questo è uno di quei libri per ragazzi che potrebbero davvero piacere a tutti. Ci sono un sacco di argomenti trattati, e quindi potrebbe venire in contro ai gusti di tutti. L'amicizia, l'amore, la famiglia, le ambientazioni un po' creepy tutte a tema Halloween, combattimenti, misteri. Assolutamente consigliato. It's been a really long time since I've read a middle grade fantasy that kept me enthralled and was original. Shadow Magic restored my faith in middle grade fantasy. It. Is. AMAZING!!!!!!! The plot and characters are well developed. And it is a fun book to read. SECOND BOOK FOF BOOKTUBATHON DONE! This was so fun. Very Game of Thrones for a middle grade novel. I loved the setting of Castle Gloom though I did find the inclusion of the love triangle unnecessary (personally could have done with out any romance in this book honestly). Hades es una copia de Desdentado y los solares de los lunares. Fuera de eso Lily es divertida y oscura y Thorn es un tópico andante de protagonista middle-grade. No está mal, está entretenido pero no tiene muchas sorpresas ni es especialmente original. Highly recommended by three authors I love--Rick Riordin, Cinda Williams Chima, & Rachel Hawkins--I could NOT wait to dig into this fantasy fiction. A Princess of Shadows, her unlikely bond with a slave, Sorcery, Necromancy, and, oh, a giant bat I fell in love with all combine into a fast-paced story that I couldn't put down. Though it's a middle-grade fiction, the depth of the characters and layers of conflict give this adult-level interest. Excellent writing, too! I especially liked the da Highly recommended by three authors I love--Rick Riordin, Cinda Williams Chima, & Rachel Hawkins--I could NOT wait to dig into this fantasy fiction. A Princess of Shadows, her unlikely bond with a slave, Sorcery, Necromancy, and, oh, a giant bat I fell in love with all combine into a fast-paced story that I couldn't put down. Though it's a middle-grade fiction, the depth of the characters and layers of conflict give this adult-level interest. Excellent writing, too! I especially liked the dark humor, and I've already marked passages to use in my 8th grade classroom next year as mentor examples for character development and description. As I already feel up-close and personal with these characters, I'm already looking forward to reading the second book in the series!!! A very good start to a new YA series about 7 kingdoms and the young adults getting read to rule them. The characters are appealing and well drawn and the writing is first-rate. Thorn, a scrappy kid from a poor family, is kidnapped by slavers and on sale when he meets the chief executioner of the Shadow Kingdom. The Shadows wield dark magic, raising ghosts and zombies to do their fighting for them. Not a natural place for Thorn who grew up in the forest and has a fearsome set of skills for living A very good start to a new YA series about 7 kingdoms and the young adults getting read to rule them. The characters are appealing and well drawn and the writing is first-rate. Thorn, a scrappy kid from a poor family, is kidnapped by slavers and on sale when he meets the chief executioner of the Shadow Kingdom. The Shadows wield dark magic, raising ghosts and zombies to do their fighting for them. Not a natural place for Thorn who grew up in the forest and has a fearsome set of skills for living in the woods, not in a land where people use bats as carrier pigeons and live in buildings which have never been exposed to natural light. In Castle Gloom Thorn meets Lily, the 13 year old heir to the Shadow empire and scheduled to be married to someone she hates. With assassination attempts and diplomacy failures there's plenty of palace intrigue to fuel several plot lines. THIS BOOK...I don't even know what to say about it. I loved it. So very, very much. This book follows the intertwining stories of runaway Thorn and Lilith, the 13-year-old Queen of Shadows. From the beginngin, I could relate to Lily's spunky and defiant attitude--definitely not how you would think a queen would act. Her determination combined with Thorn's wit and confidence made for a magical story that's impossible to put down. And a giant bat? The perfect touch. Overall, the book was beautifully THIS BOOK...I don't even know what to say about it. I loved it. So very, very much. Cattivo abbastanza prevedibile e per il momento non mi sono affezionata appieno ai personaggi. A parte questo piccolo dettaglio mi è piaciuto davvero tanto. Anche se il finale non mi ha spronata più di tanto a leggere il secondo, sembra un po' autoconclusivo e invece ci sono altri due libri. Eh eh eh, ha sido muy guay, tiene unos cuantos puntazos, y el misterio ha sido adictivo. Tengo ganas de continuar con la historia! Captured by slavers while trying to locate his father, Thorn is purchased by Tyburn, an executioner who works for the House Shadow. Agreeing to work a year and a day in exchange for his freedom, Thorn heads to Castle Gloom with Tyburn. There, he meets Lily Shadow. Except for her drunk of an uncle, her family was all recently murdered by a group of assassins. Tyburn managed to kill all but one and now that assassin seems to be back to murder Lily and Lily's betrothed may be the one who hired them Captured by slavers while trying to locate his father, Thorn is purchased by Tyburn, an executioner who works for the House Shadow. Agreeing to work a year and a day in exchange for his freedom, Thorn heads to Castle Gloom with Tyburn. There, he meets Lily Shadow. Except for her drunk of an uncle, her family was all recently murdered by a group of assassins. Tyburn managed to kill all but one and now that assassin seems to be back to murder Lily and Lily's betrothed may be the one who hired them. With no ideas who to trust, Thorn begins to look into what happened. As he and Tyburn look into the threat, however, Thorn starts to wonder if his father may be mixed up in it all. Could his father really be an assassin or is it Lily's obnoxious betrothed? Can Thorn save Lily? The characters in this novel are amazingly well developed and the author does a great job of building the mystery behind their pasts. The plot is complex, engaging, and easily draws the reader into the story. Fans of mystery, magic, adventure, and fantasy will enjoy reading this book. Please note: A copy of this book was given to us in exchange for an honest review. All opinions expressed, however, are our own. My review was first posted on Northern Plunder, you can read more of my reviews there too. It's been a long time since I've read something thats middle grade and at first this provided a few issues for me simply because I kept forgetting the main characters were only 12 / 13 and that meant the way they were acting - childish, not thinking things through, etc - were completely fitting for them. However once I got past this and firmly remembered that yes these are just children that I'm reading abou My review was first posted on Northern Plunder, you can read more of my reviews there too. However once I got past this and firmly remembered that yes these are just children that I'm reading about it was a much better story. Shadow Magic follows Thorn - a slave who's not supposed to be a slave - and Lily - who's not supposed to be the ruler of Gehenna. This is a story that shouldn't of happened but did, and I'm glad it did even though that means a few unhappy things had to happen for it to take place. But no great story is without its down moments - death in particular which really surprised me at times - and these children make the best of them. Thorn quickly finds himself as the squire to the famed executioner of Gehanna where he befriends Lily and K'leef and the three of them kind of try to find out who's been trying to assasinate Lily. I say kind of because at the end of the day they are kids so it doens't always go as smoothly as they'd have hoped but its a great story and watching them piece it all together is one great journey. My favourite character, which isn't a spoiler because they're right there on the cover, is Hades. Hades is a giant bat, like humongous. He's great and his friendship with Thorn is super cute. Custard, a black puppy, stole my heart a little too. Ultimately what really impressed me about this book was how good and evil isn't always as clear as day and night. Just because Lily is from a long line of necromancers who use shadow magic doesn't mean her whole family is inherinetly evil and I think this is a really good thing for the MG readers to learn. I think I really look forward to seeing how she grows as a character even more in the series, well all the characters really, none of them are flat and boring and they all bring something unqiue to the story which is why I enjoyed it so much. Writes a bit about goth princesses, outlaws and giant bats. And zombies. Lives in London but would rather live in a castle and is a lot less scary in real life than his photo would suggest.